UDAP provides more bear deterrent sizes and accessories than any of the competition. We offer 3 different bear spray sizes. Each individual can decide what size is right for them. All 3 sizes are registered with the EPA and meet all the guidelines to be an official bear spray product. The only difference in the size is the amount of spray and spray time. Each has the same force behind the spray. UDAP products are formulated and filled in the USA. Bear deterrent pepper spray is a governed product by the Environmental Protection Agency (EPA). In order for a manufacturer to make and sell a Bear Deterrent, they must first obtain an EPA registration number for their product. Sub-registrations are also allowed for distributors that want their own brand but do not want to register their own product. UDAP knows the importance of bear safety, bear spray training and information. This is why we include a bear safety tips booklet with every purchase of bear spray. 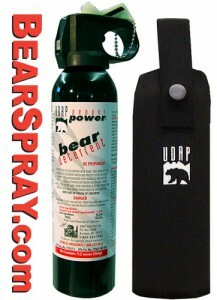 Bear deterrent or bear pepper spray is designed to be sprayed in the face of a charging bear. It does not matter if the bear is a grizzly (also known as a brown bear or Kodiak), black, or polar bear. Bear deterrent spray works on all species of bear. Similar to the use of pepper spray for humans, bear pepper spray affects the eyes, nose and throat of the bear. 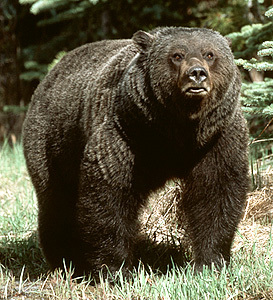 However, unlike personal pepper spray, bear spray is specifically designed for this large predator. Bear deterrent is much stronger than personal protection sprays and has a much higher volume of spray when released. Bear deterrent sprays a further distance (30-35 feet) than small units designed for self defense and sprays in a fog pattern instead of a stream, foam or gel. A fog pattern pepper spray is much more effective when stopping an animal because of the fogs ability to be sucked into the airway of the breathing animal. 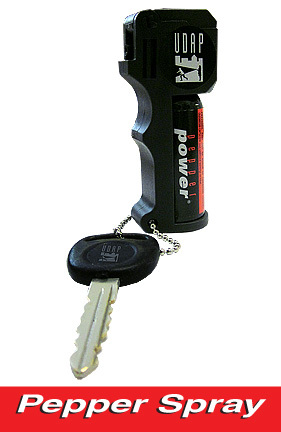 Pepper Sprays for your key chain and the like would not work for bears. The minimum size for bear pepper spray is 7.9 ounces or 225 grams. Each bear deterrent will contain an EPA registration and establishment number, date code, and the words “bear deterrent”, “bear spray”, “bear pepper spray”, “bear mace” or “bear repellent”. Bear repellent is not a very suitable word for this product and only one manufacturer uses it. The word repellent can confuse the user in to thinking they can spray themselves or equipment like bug repellent spray. This is NOT the proper way to use bear deterrent. You need to spray the bear in the face as it is charging for it to be used correctly. In 1999, The EPA wanted to specifically label bear pepper spray as a repellent. However, this mislead the public and the vendors to think this product was to be applied to themselves and the site or equipment like bug repellent spray. Mark Matheny worked to change the word “repellent” to “deterrent” to stop the misuse of the product and explain further the proper use of the spray for deterring a potential bear attack. Even though the words deterrent and repellent have the same meaning, repellent is used in relation to insect spray so commonly that deterrent is a much better fit. Bear pepper spray deterrent is proven your best defense in stopping a bear attack. Remember to carry your bear pepper spray where it is accessible and know how to use it. You will be relying on your reflexes to help you get your spray deployed into the face of a charging bear. Practice several times going for your spray. This simple step can be life saving. The #15 Magnum Bear Spray is a little larger than the #12. This bear spray offers the same powerful blast with a little more product. Available in 3 combinations. #15 Can Only #15HP Hip Holster Combo #15CP Chest Holster Combo The best in its class! Unlike other brands that spray a slower forming narrow fog of bear pepper spray, UDAP Pepper Power Bear Spray deploys a high volume powerful blast of highly concentrated pepper spray in a dense fog – covering a broader area in a much shorter period of time. Instead of spray a narrow slow forming cloud of spray we push it out so it overwhelms the bear instantly. Click here to read more about spray volume.